Just under 300MB, PlayStation 4 system software update 3.50 is now available to download, adding new features like PC/Mac Remote Play (grab the client here), the ability to appear offline, and friend online notifications. You can now create events. Select [Events] > [Create Event], set the date and time, number of players who can join, and other details, and then send invitations to players you want to play with. You can also create events in [Messages]. Play Together has been added to [Party]. For online multiplayer games that support the Play Together feature, you can automatically invite other players and start game sessions immediately. Notification messages are now displayed when Friends go online. You can change the setting in [Settings] > [Notifications] > [When Friends Go Online]. You can now use Remote Play on a computer (Windows PC or Mac) that has PS4 Remote Play installed. To do this, download the PS4 Remote Play app, install it, and then connect to your PS4™ system. Within a game, you may appear online to other players. Your use of social features (such as ‘Share’) may be visible to other users. 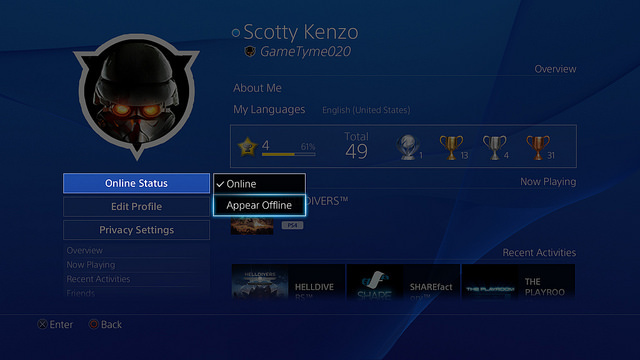 When you sign-in on PS3, PS Vita or PS TV, you will appear online. You can now share other players’ activities. In What’s New, for example, select an activity to share, and then select ‘Share Activity’. When uploading screenshots or video clips, players can now tag others they’ve played games with. To choose who can tag you, select [Settings] > [PlayStation Network/Account Management] > [Privacy Settings] > [Sharing Your Experience] > [Tags]. For the best results with PC/Mac Remote Play, Sony suggests having a high-speed internet connection with upload and download speeds of at least 12 Mbps. After downloading update 3.50, you can let Sony know your feedback in this thread, and you can tell them your favorite feature in this poll. To download the update through the internet, head over to the US and UK PlayStation sites for more information.